I really wanted to make it all the way through the “Blogging through the Alphabet” challenge, so I am going to try and catch up even though I am a few weeks behind. 🙂 Maybe I can do N, O, P and Q over the next few days to be in time for “R” next week! Miss M and Mr. E wrote out the text they wanted to have appear in the newspaper. This time Mr. K drew a picture and a friend contributed the comic. I helped with spelling, layout and adding the pictures. We made a bit less than 20 copies, and Miss M delivered them to neighbors, and friends at tennis class. 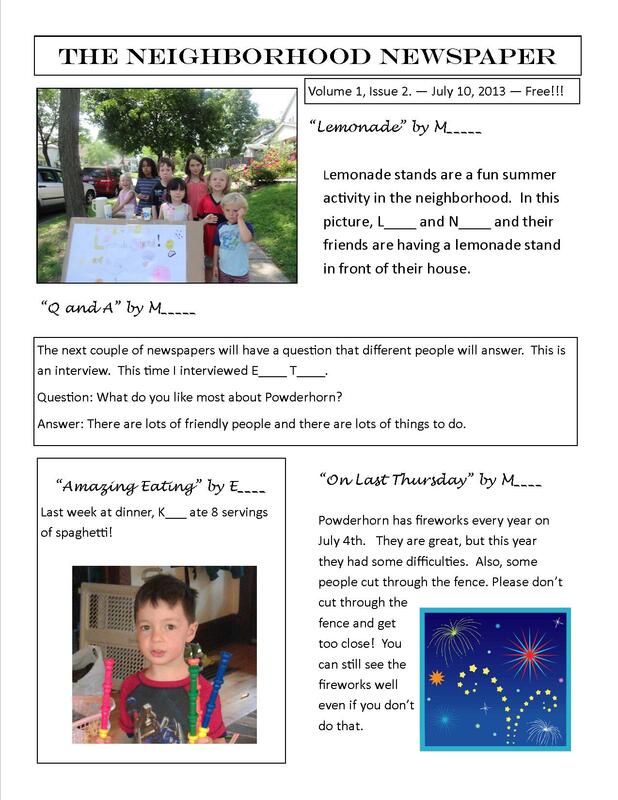 The Neighborhood Newspaper is a project that I am definitely going to encourage. I am hoping that Miss M wants to continue it even beyond the summer! 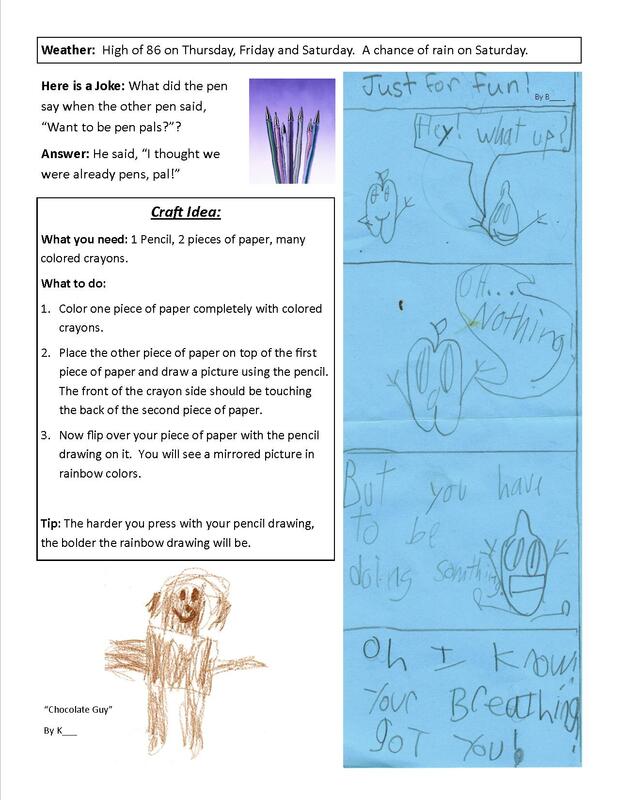 It’s a great project to wrap into homeschooling. Miss M and Mr. E can practice writing, typing, photography and drawing. I’m thinking I should be able to teach Miss M sometime soon how to arrange the newspaper in Microsoft Publisher. And there are all kinds of possibilities for teamwork and collaboration as other friends want to make contributions (a friend has already contributed a comic for issue #3!). Life has its share of frustrations big and small – some of mine this week have included catching the dreaded “spring head cold” (just when you thought you escaped cold season without getting sick, you find out you aren’t out of the woods yet! ), the return of snow and cold yet again after a beautiful weekend that tricked us into thinking that spring was really here to stay, and two months of spotty internet service (we’re finally getting a new ISP at the end of the week!). I’m trying to stay thankful in all those circumstances, but it’s definitely been a bit harder than usual to keep the frustrations at bay this week! How about when our students get frustrated doing schoolwork? My oldest child really likes her schoolwork to fall in that “sweet spot” of not-to-hard, not-to-easy. Too easy, and it might be boring. Too hard and…well, the results aren’t always pretty. Sometimes, the assignment is not too hard, but we have a hard time being on the same wavelength communication-wise. 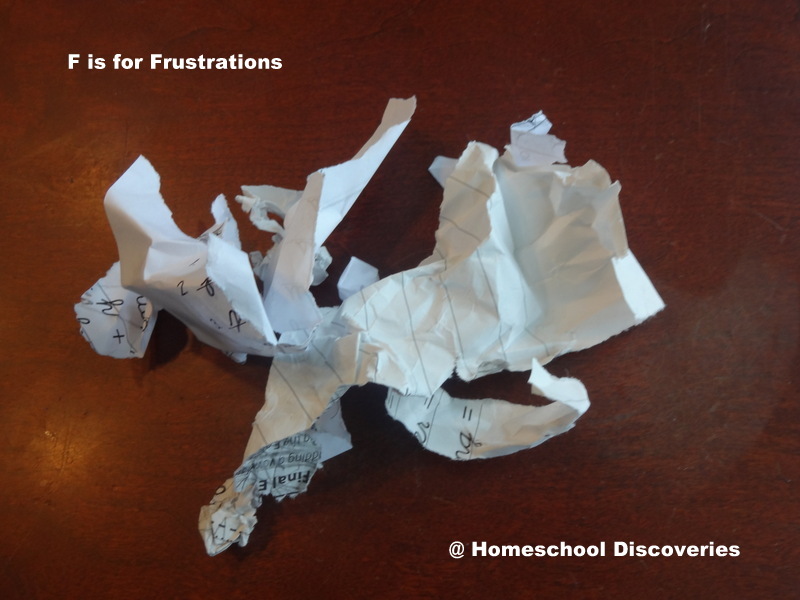 Sometimes a frustration is really not about the assignment at hand, but about something else (that was the case with the crumpled spelling worksheet in the picture). Some days any schoolwork might end in frustration if the student would rather being doing something else (or anything else!). I know all students have their moments of frustration, but M maybe has a bit harder time than some kids properly channeling her frustration — Or maybe a lower tolerance for puzzling through a difficult problem (especially in math!). I definitely see frustration-related behaviors that I’m trying to help her avoid. I’m trying to find ways to avoid the frustrations in the first place, of course. A little bit can go a long way. We may play soothing music in the background during a difficult subject. I make sure M is getting plenty of snacks and breaks. Even with those preventative measures, frustrations do still occur. And sometimes in the hurry of the day we forget a preventative measure! On those frustrating days I’m trying out a variety of means to help M regain her composure. I often suggest taking a break, praying, reading scripture, or approaching the problem a new way. Often times my suggestions are not met very favorably. Sometimes I just wait it out. Sometimes a consequence of some sort is needed if frustrations are expressed inappropriately. I don’t know that I’ve found all the answers. Sometimes it feels like things can spiral out of control with one frustration leading to another. But I trust that God is working in my character and Miss M’s character to make us both more like Christ. How do you handle situations where your student gets frustrated? Do you have any suggestions for us? I have a few items I’m trying to sell that have been languishing on my shelves — Things we are done with and things we decided not to use and things I wish I could have used but it just never worked out that way. 😉 I’ll be linking up today with the Curriculum Sale @ the Happy Housewife, so check that link out if you are in the market to shop for other items! The “Fine Print”: Please plan on paying via PayPal. Prices do not include shipping. If you are only interested in one item, plan on adding about $4 for media mail shipping or $6 for priority mail. Kindermath is light enough to go 1st class for slightly less. Email me at kirsten at tonyandkirsten dot org with the item(s) you are interested in purchasing and I will weigh the items and get you a more specific quote on shipping. I am located in Minneapolis, MN and would be glad to discuss meeting locally for pickup/cash payment. I will update this post as any items are sold by deleting sold items. When I joined the “Blogging through the Alphabet” challenge, I had great intentions of writing a separate post for each letter of the alphabet about something homeschooling-related. I made a document with ideas for every letter…but “J” really stumped me, and I missed that week all together. I even considered having a “jammies” day just so I could do “J is for Jammies.” But unlike (apparently) many homeschoolers, the thought the thought of a day in my jammies and having to see my kids in their jammies all day was enough to drive me batty. I am so not a jammie day person! Even my babies get dressed for the day! So, with that personal quirk out there, I was at a loss for anything related to homeschooling that started with “J” that I would actually have anything to say about, and my ideas for “K” weren’t much better. Places I’ve lived…: I currently live in Minneapolis, Minnesota. Growing up, I lived in several other towns in Minnesota (Mankato, New Ulm, Willmar and St. Cloud). I also lived in Ames, Iowa for eleven and a half years (college plus the following 8 years). I tell people I’m “originally from” St. Cloud, MN since that’s where I graduated from high school and where my mom still lives, though I actually only lived there for four years. When I was growing up I wanted to be…: For a long time I wanted to be a chemist or a computer programmer. Then my mom told me that chemists make bad things that hurt the earth and that by the time I grew up that computers would program themselves. 😉 Next I decided I wanted to be a civil engineer and build bridges. In college I studied…: My first major was, in fact, Civil Engineering. However, after getting a “D” in freshman physics, I took a hard look at myself and my abilities and realized that my true love was all things related to language and communication NOT science and engineering! I changed my major to English with an emphasis in Rhetoric and Professional Communication. I was considering pursuing a career in technical writing or technical editing, but God had other plans for my life! After college I…: While finishing up college at Iowa State University, I felt called by God to pursue full-time Christian ministry after graduation. I did not grow up going to church, but I placed my trust in Christ and became a Christian my junior year of high school. As a freshman in college I found a great church where I grew in my faith, made lots of close friends and spent a lot of time involved with various campus ministry endeavors. How “boy meets girl”…: My husband and I both attended the same church in Ames, Iowa. We worked together in a few ministry roles, and the sparks flew. After a short courtship and engagement, we were married in September of 2002…hard to believe it is our tenth anniversary this year! Time flies when you are having fun! Tony was working on his PhD when we first got married, so we knew we would stay in Ames at least until he was done with school. How I ended up here…: We moved to Minneapolis, MN so my husband could pursue post-doctoral research. We stayed after that was over because we didn’t feel like God was telling us to go anywhere else! Tony left the academic career path for a job in industry. We love the church that God led us to here and the city neighborhood in which we live. Why we decided to homeschool…: The short answer is that we were impressed by the lives of homeschooled kids we knew in our church in Ames (both kids still in school and friends we knew as fellow college students who had been homeschooled themselves). We wanted to have the same opportunity to influence our kids during their formative years. We hope to use homeschooling as an opportunity to raise kids of outstanding character that we can launch into the world as kids/young adults who will positively impact others for the kingdom of God. Why I started this blog…: I had a “general” blog (it started out as our wedding website!) for many years. It was really just intended for family and friends to read and what I wrote about changed as I changed and as our life changed. We let the hosting for that blog expire last summer and I realized I missed having a creative outlet for writing. But I also decided that “this time around” I wanted to focus on a topic I am passionate about (homeschooling, with a focus on books/reading) and reach out to develop broader readership beyond my facebook friends. I want to share my “finds” and chronicle our homeschool experience along the way. What I like to do in my “spare” time: Now that I have this blog, I like to blog in my “spare” time! Other than that, I really like to cook and bake (I am obsessed with breakfast baked goods! ), read books and blogs, and hunt for bargains at thrift stores and garage sales. I also really like playing board games, trying new restaurants and generally experiencing adventures in the city with my family. What I want to do when I grow up when my kids grow up: I envision I might have another “career” of some sort later in life. Maybe! I day dream about jobs involving books, history, or writing…or maybe I could come up with some combination of the three! At least I have a while to figure that out. 😉 Just a blog and a very part time editing job is plenty for me right now on top of juggling all the responsibilities of staying at home with my four kids! Visit the “K” post link-up @ Ben and Me to see what other bloggers came up with for the letter K! Hi! 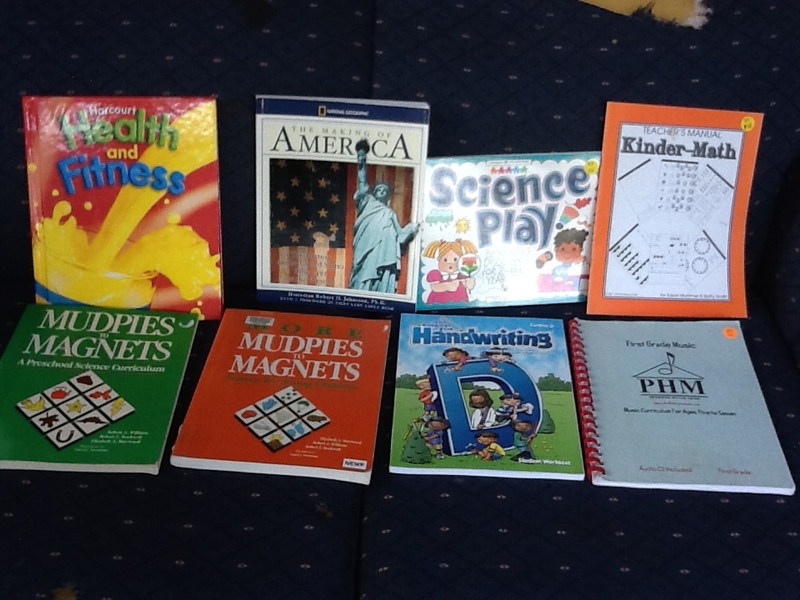 Welcome to my new blog, Homeschool Discoveries. I had a general purpose blog for about eight years, and my post topics changed and varied as my life changed through those years as we started our family, moved, changed jobs, added to our family, had various hobbies and interests, and began homeschooling. After letting my old blog lie dormant for a good part of a year, I decided it was time to leave the old behind and try something new — a blog focused on my passion to share my discoveries along the way in the journey of homeschooling. I love to share with others about the books we’re reading, the curriculum we are using (or even ones we’re not using but have researched or checked out), interesting websites and more. I hope this blog will be informative, helpful, and maybe even inspirational at times, just as so many other homeschooling blogs have been that for me.